Many people – including economists – are are confused about whether or not countries can default. 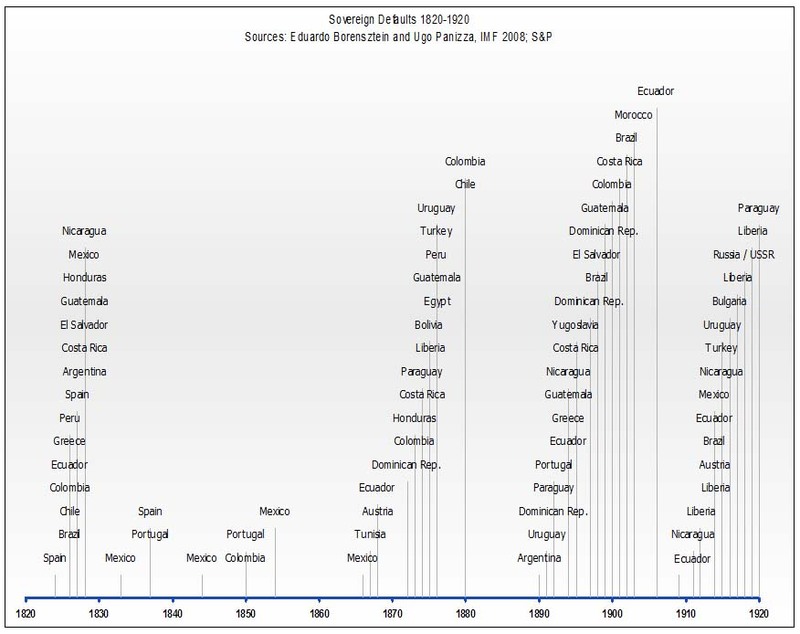 Habsburg Spain defaulted on all or part of its debt 14 times between 1557 and 1696 and also succumbed to inflation due to a surfeit of New World silver. Prerevolutionary France was spending 62 percent of royal revenue on debt service by 1788. The Ottoman Empire went the same way: interest payments and amortization rose from 15 percent of the budget in 1860 to 50 percent in 1875. And don’t forget the last great English-speaking empire. By the interwar years, interest payments were consuming 44 percent of the British budget, making it intensely difficult to rearm in the face of a new German threat. 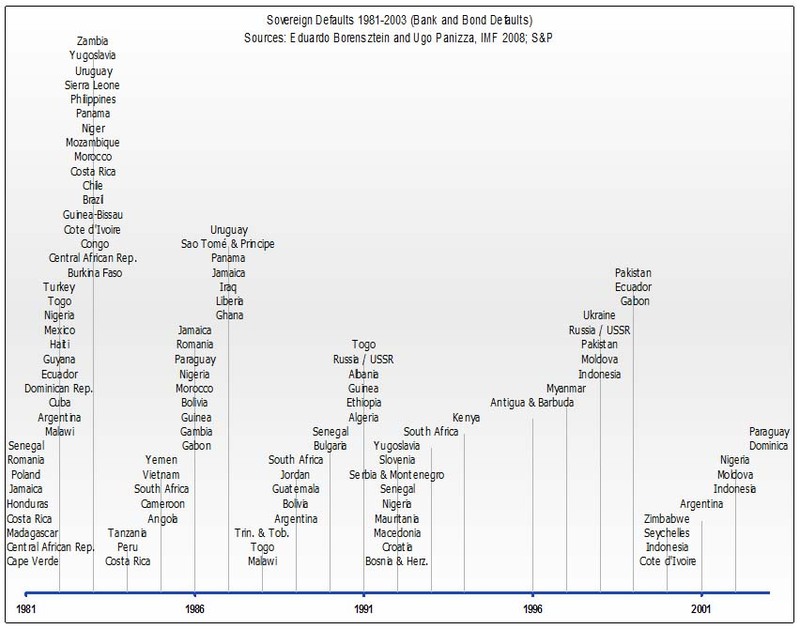 In fact, as the IMF’s Eduardo Borensztein and Ugo Panizza have shown, countries default all of the time. Land values soared. States splurged on new programs. Then it all went bust, bringing down banks and state governments with them. This wasn’t America in 2011, it was America in 1841, when a now-forgotten depression pushed eight states and a desolate territory called Florida into the unthinkable: They defaulted on debts. But America Can’t Default … Can It? Mainstream American economists argue that – because we have world’s reserve currency – America can never default. Specifically, they say we can always print up more money to pay our creditors. This may technically be true, although the dollar’s status as reserve currency is slipping away. Washington had already defaulted on its loans by allowing the dollar to weaken against other currencies – eroding the wealth of creditors including China, Guan said. It is printing massive numbers of dollars which has caused the dollar to weaken against other currencies. So while America may not technically default, it may default in practice, by printing so many dollars that creditors don’t want to lend, except for a very steep price. How did Greece, Iceland and other countries get to the point of default? BIS (the “Central Banks’ Central Bank”) said in 2008 that said that the massive bailouts are putting nations at risk. Unlike 1929, the world’s major countries are flooding the economy with money to prevent deflation and, with it, a downward spiral of declining prices and income. But no one knows whether this will suffice, or whether all the money being thrown at the aggressive virus fueling this crisis will only make it worse. Debts are being fought with debts, meaning that not only banks but entire countries could end up bankrupt. Perhaps the efforts to combat the current crisis are merely laying the foundations for the next crisis, which will be bigger still. That is what is happening today. Of course, if the governments had chosen the little guy instead of the giant banks, the consumer would have more resources and confidence, small businesses would be hiring, economies would stabilize, and governments would as well. By choosing the big banks over the little guy, the governments have doomed both.